This spicy and fiery hot salmon preparation is just so addictive and delicious that you would love to have this healthy treat every single day. The char grilled flavors on the fish are so warm and welcoming that you would love to enjoy anytime of the year. 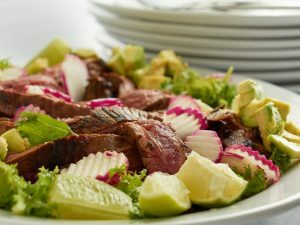 It is a perfect barbeque dish that you may also enjoy as a part of healthy diet over a bed of fresh salad! Place the salmon filets on a large baking dish and keep aside. 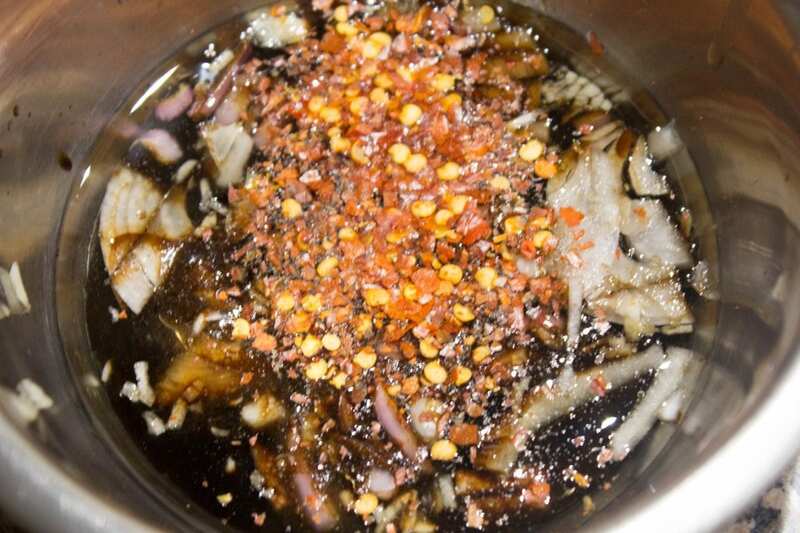 In a small bowl add canola oil, soy sauce, balsamic vinegar, chopped onion, brown sugar, minced garlic, grated ginger, red pepper flakes, salt, and mix everything well until combined. 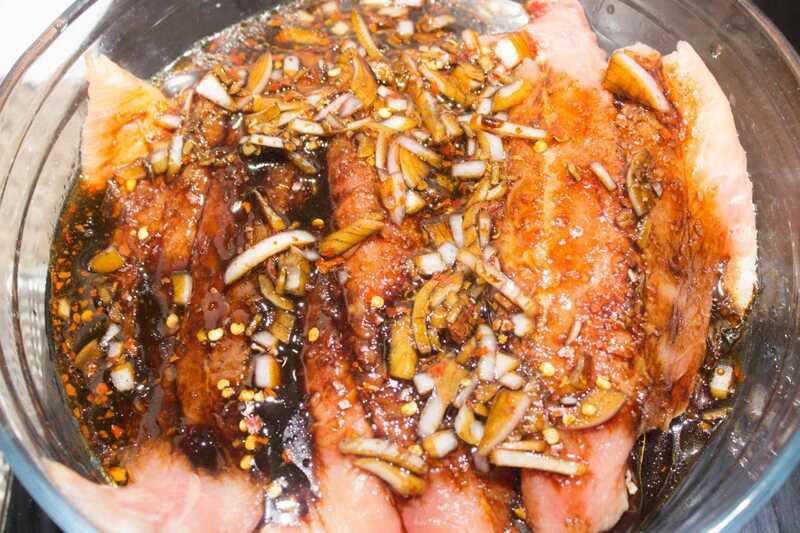 Add the marinade to the salmon fillets and coat the fish pieces in marinade well from all sides. Cover and let the salmon marinate for about 30 minutes. Meanwhile, heat the grill to super hot temperature. 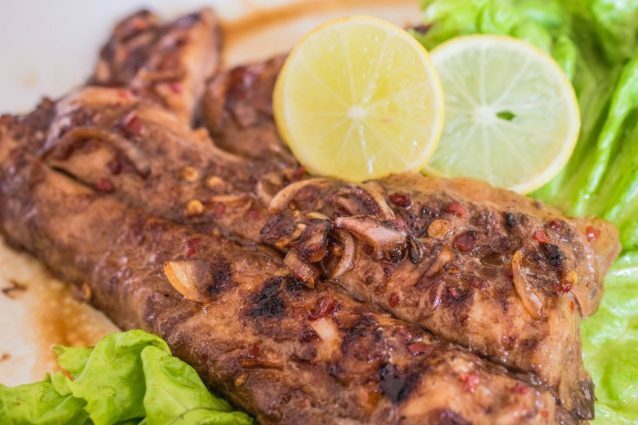 Place the fish pieces on to the hot grill and cook them while brushing with marinade sauce in between for 8 to 10 minutes or until the fish is just about flaky. Flip the fish and cook on the other side as well for about 3 to 4 minutes while brushing it with the marinade intermittently. Repeat with the remaining salmon fillets and serve grilled fish over a bed of fresh lettuce and with some fresh lemon slices. Serve hot and enjoy! 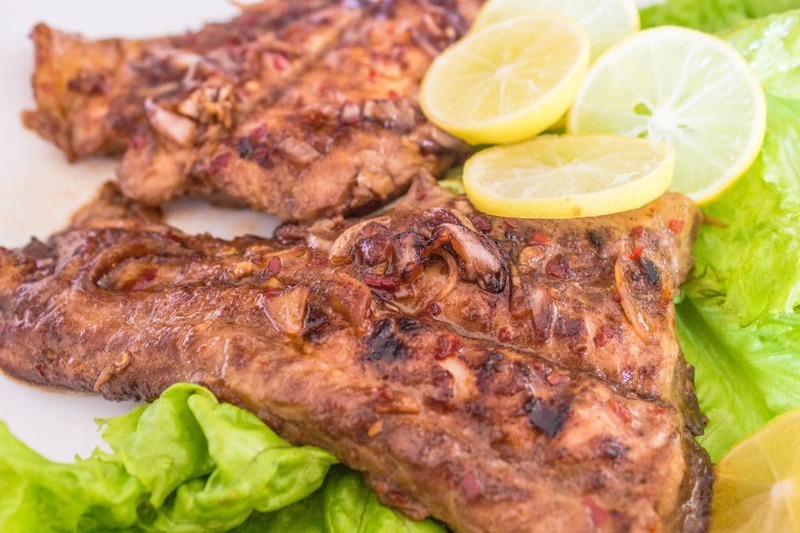 You may marinate the fish for even up to 4 to 5 hours to make the fish more flavorful. 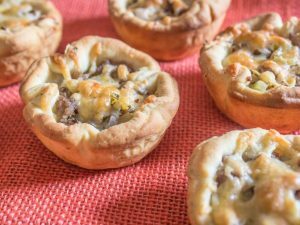 You may also replace fresh garlic with a ¾ teaspoon of garlic powder. Turn the remaining marinade in to the dipping sauce by cooking the remaining marinade with ¼ cup of water until it starts to boil. Add 2 tablespoons of honey and about 2 tablespoons of corn starch slurry to the boiling marinade and continue it to boil for a minute until the sauce starts to thicken and has a glossy sheen.